On March 1, 2012, Her Majesty Queen Elizabeth II along with the Duchess of Cornwall and the Duchess of Cambridge visited Fortnum & Mason in London, England. During the visit Her Majesty Queen Elizabeth II “….officially opening the Fortnum and Mason Diamond Jubilee Tea Salon…” as well as unveiled a plaque. Click the links below to watch videos as well as photos. 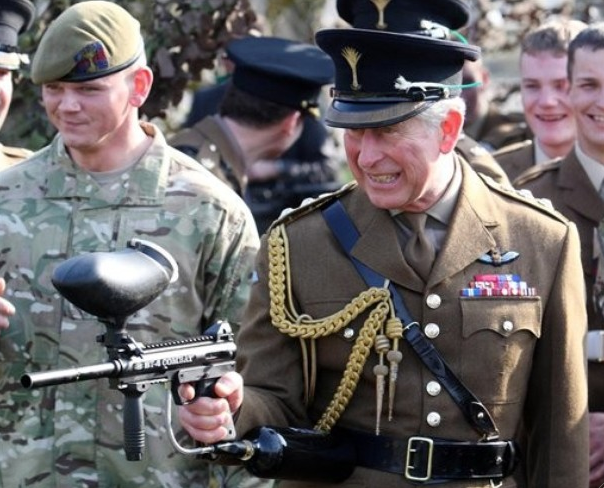 On March 1, 2012, His Royal Highness the Prince of Wales was in Hounslow, England where he celebrated St. Day’s Day with the 1st Battalion Welsh Guards at the Cavalry Barracks. During today’s celebrations the heir to the British throne presented ceremonial leeks to the soldiers. The prince began his visit with a private meeting with former Welsh Guards in the officers’ mess before presenting long service medals to several soldiers. Before spending half an hour mingling and sharing a drink with the soldiers, Charles presented an injured Afghanistan veteran with his medal for serving in Helmand province. Click here to watch a news report (article included). Her Royal Highness Princess Letizia of Asturias presided over the “World Day of Rare Diseases” held at the headquarters of the General Council of the Judiciary in Madrid, Spain on March 1, 2012. The Princess was accompanied by the Chairman of the Supreme Court and the Council General of the Poder Judicial (CGPJ), Mr. Carlos Dívar, the Minister of Health, Social Services and Equality, Mr. Ana Mato, and the President of the Spanish Federation for Rare Diseases (ERDF), Ms. Isabel Calvo. …I’ll repeat what I said three years ago, that no person with a rare disease nor those who surround and supports them sits alone, isolated, uninformed, helpless and without opportunities. If we work together for them and work more, we can maintain hope. The Spanish Federation for Rare Diseases (ERDF), in collaboration with the European Organization for Rare Diseases (EURORDIS), organized the campaign of raising awareness in Spain to claim the right to life and to support people living with rare diseases. His Majesty King Juan Carlos I of Spain Fly’s in a Plane! Exciting!! 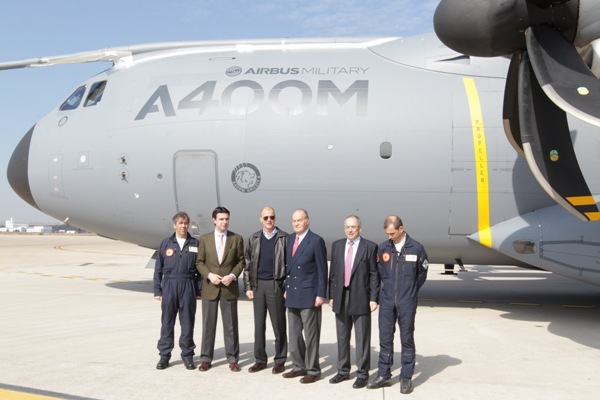 His Majesty King Juan Carlos I of Spain flew in the new aircraft the Military Airbus A400M which took off from Torrejon Air Base on March 1, 2012. His Majesty was accompanied by the Minister of Industry, Energy and Tourism, Mr. José Manuel Soria, Mr. José Jiménez Ruiz, the Delegate Director (CEO) of Airbus, Mr. Tom Enders, and Airbus Military President and Chairman of EADS CASA, Mr. Domingo Ureña. His Majesty the King has been the first Head of State, which has flown in the Airbus Military A400M, on a flight which last roughly 40 minutes long. The pilots of the Military A400M Airbus were Mr. Edward Strongman, Mr. Ignacio Lombo, and Mr. Fernando Alonso. During the flight His Majesty King Juan Carlos I took the controls of the aircraft and at an altitude of about 10,000 feet and made a series of maneuvers, including cornering, and more. It was announced by RVD via Het Koninklijk Huis, that His Royal Highness Prince Johan Friso of Oranje-Nassau has been transported from Innsbruck University Hospital in Austria to Wellington Hospital in London for further care. His Royal Highness Prince Friso has arrived in London today, his hometown for the past several years. 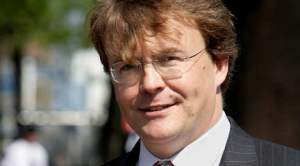 Based on opinions by medical experts, Wellington Hospital was chosen where Prince Friso, in his current condition, can receive the best care for his needs. London also provides for his children the most prospect of continuity and stability. Today marks an ends of a long and intensive period for the Royal family and in particular the family of Prince Friso. Now it is time to begin the rehabilitation process, which will be tried to start. The family of His Royal Highness Prince Friso has all the space needed to cope with the health situation of Prince Friso and life there on in to focus. The family therefore invites the media to continue the necessary privacy of the family. Princess Mabel would like to express her gratitude for all the messages of support and expressions of sympathy, “The warm compassion in the past period has given me support and strength. My gratitude for this is big. Thank you. Her Majesty the Queen, Princess Mabel and her children have also departed from Lech, Austria to London. Click here to watch a news report (in Dutch).